After several rounds of tough competition Sunday night, Olivia Jordan will go on to represent America in the Miss Universe Pageant next year. But Donald Trump ended up skipping the Miss USA pageant he co-owns, a contest that was caught up in headlines after the Republican presidential candidate made disparaging remarks about Mexicans last month. Thankfully, both he and the controversy were far away from the stunning spectacle — quite literally, actually. Despite previously insisting he would appear, Trump on Saturday announced on Twitter he would not attend the pageant due to campaign obligations in Phoenix. A Trump spokesman told CNN the business mogul had a rally in the Arizona city on Saturday yet was traveling to New York the day of the pageant. CNN also reported that a flight tracking service indicated a plane used by Trump landed in New York in the early hours of Sunday morning, though whether the GOP candidate was onboard is unknown. As of late Sunday evening, Trump did not comment on Jordan's win or any aspect of the competition. Instead, his Twitter feed focused on Mexican drug lord Joaquin "El Chapo" Guzman who escaped from prison earlier in the day. Trump used the head of the Sinaloa Cartel's prison break as further proof of his controversial comments, which accused America's neighbor to the south of illegally sending drugs, crime, and rapists across the U.S.-Mexico border. No one appeared to miss Trump at the pageant, and there were barely any references to his racialized remarks. 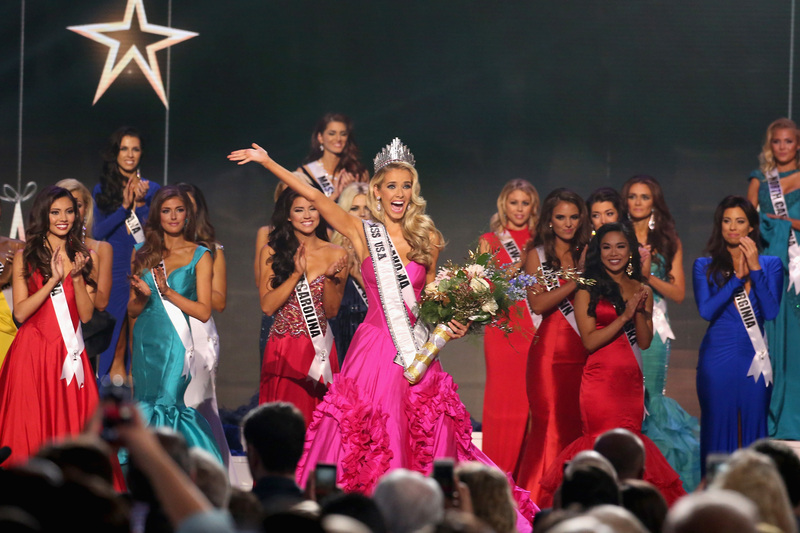 At the beginning of the show, Miss USA co-host Todd Newton said the pageant had "become the most anticipated and what will be the greatest night in recent pageant history," while one judge applauded the contestants' resolve despite the "chaos of the past couple weeks." It was a competition whose fate was unknown after NBCUniversal and Univision boycotted the pageant. Earlier this month, small cable channel Reelz announced it instead would carry the competition. There were a number of contestants with Hispanic backgrounds, and to have those accomplished women stomp out Trump's dumb remarks was great. It was proof that one misguided man, no matter how powerful or how loud he can be, can't tear down the resolve of 51 women who have prepared for this competition their entire lives.